Eunoia, Dr. Ramie Vetter’s mental health practice, has grown from a one-person office to seven locations across Southern Minnesota. For many, life is like a roller coaster. Long climbs to reach a high point, only to find a drop off waiting once you get there. Twists and turns that can be both exhilarating and frightening. Dr. Ramie Vetter, having ridden roller coasters himself throughout his lifetime, wants to help others stay on the tracks. He calls it a job, but he’ll admit it doesn’t really seem like work to him. It’s that passion that led to Dr. Vetter’s decision to open his own practice in Fairmont in 2008. He named his practice Eunoia, pronounced ee-OH-nee-ah, fully understanding not many would know its meaning or its pronunciation. But he knew, at the very least, it would get people talking, the whole point of what he is trying to do. “Its Greek derivative means ‘well-minded’,” explains Dr. Vetter. Eunoia Family Resource Center is a group of mental health clinics specializing in individual, couples, family and group therapy, as well as psychological testing and psychiatric services. In rhetoric, Eunoia indicates the goodwill a speaker cultivates between himself and his audience. Dr. Vetter immediately found an audience, a need for his services in the region. Eunoia now has 7 locations throughout southern Minnesota. Dr. Vetter now has Eunoia offices in Blue Earth, Fairmont, Gaylord, Mankato, New Ulm, and two locations in St. James. The therapists at each location are from the towns they serve and have unique understanding of the needs of each community. Dr. Vetter says that is one special thing about Eunoia, big resources yet small enough to adapt to the needs of each area. For instance, one therapist in the St. James office, Lucia Beckendorf, is the only Spanish-speaking therapist in the region. Another, Dr. Brandon Scott Dugan, provides the Marchak method for parenting evaluations. Eunoia has 19 therapists from different realms and eight support staff. The timeline has a quick progression. It moved from its original Fairmont location into its current spot at 1420 N State Street in 2012. 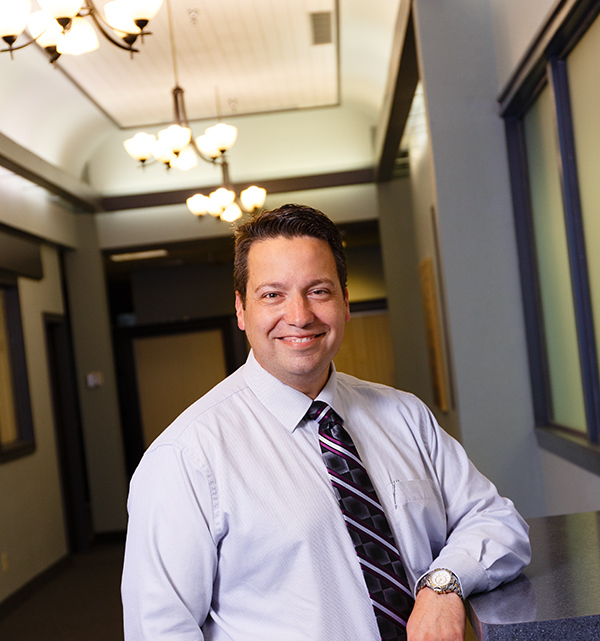 Dr. Vetter opened his first St. James location in 2013 and added another in that city in 2014. Also in 2014, he opened in Blue Earth and New Ulm. Then in 2015, he expanded into Gaylord. And in March 2016, he reached into Mankato. He is taking a breather from expanding right now while he focuses on establishing the Mankato office, which just opened in March in the Madison East Mall. Dr. Vetter said it was immediately evident the Mankato market has a need for Eunoia’s services. Aside from all of his degrees and professional lauds, Dr. Vetter says his personal experiences also give him a keen understanding of what some of his clients might be going through. Dr. Vetter agreed, but initially it proved harder than he thought. “Once I finished school and my doctoral training, my internship was in Springfield, Missouri. During that time, I was helping families either reunite or deal with the potential of terminating parental rights. It was hard, intensive work but beneficial. Armed with his own life experiences, Dr. Vetter put together a business plan to not only help residents in the region but the therapists under him as well. And, in a line of work that deals with heavy stuff on a daily basis, Eunoia is there to support its staff’s well being. With the opening of the Mankato office, he sees an opportunity to foster those wanting to enter the field as well. Eunoia also strives to take part in the National Health Service Corps, a federally-backed loan repayment program to recruit providers to an area. One key component of that special program is that if someone can’t pay for the therapy they need, the therapist will provide it for free. Another area Eunoia is making its mark in Southern Minnesota is through employee assistance programs or EAPs. An EAP is a service provided by employers to assist employees with personal or work-related problems that may impact their job performance, health, or mental or emotional well-being. EAPs generally offer assessments, short-term counseling, referrals, and follow-up services for employees. EAP counselors also work in a consultative role with managers and supervisors to address employee and organizational challenges and needs. Eunoia – a different sort of name, for a business Dr. Vetter hopes is making a difference in the communities it serves. Dr. Vetter certainly has an impressive resume. He has earned a Masters of Arts in Marriage and Family Therapy, a Master of Arts in Psychology, and a Doctorate of Professional Psychology. But Dr. Vetter is not all work and no play. His hobbies include working with Boy Scouts, camping, hiking, building computers, and pheasant hunting. Dr. Vetter has been married to his wife, Bonnie, for 19 years. They have three sons; 13-year-old Parker, 11-year-old Noah and 6-year-old Jonah. His wife and children are a big reason he now calls Fairmont home. EAPs may be more common than many think both for large and small businesses. Two decades ago, the U.S. Bureau of Labor Statistics estimated that 58 percent of full-time employees had access to an EAP. Today, the Employee Assistance Professionals Association reports that 97 percent of corporations with more than 5,000 employees, 80 percent of those with between 1,001 and 5,000 employees and 75 percent of those with between 251 and 1,000 employees have such a program in place. What is behind the influx? Experts believe it comes down to one thing: The workplace can be a stressful environment. Discontented workers may not work as hard as satisfied workers and might miss work due to unscheduled absences, such as calling in sick. So helping employees find ways to deal with that stress is an important part of maintaining productivity and job satisfaction. So, just what is an EAP? An employee assistance program is a benefit which usually provides short-term counseling for employees regarding issues that can affect their on-the-job performance, such as addictions, financial problems and emotional issues. If long-term counseling is necessary, EAPs offer referral services. Analysts have found that employers that invest in employees by providing EAP services see a high return on investment rate. According to Monster, each dollar put into establishing and maintaining an EAP saves as much as $5 to $16 in terms of absenteeism, accidents and increased costs in the form of medical benefits and workers’ compensation claims.